Fight, for the Night, to Par-ty! About 19 hours after the Commander’s sword was broken, he gets a call from Tokugawa, his grandfather, that he’s coming to see me. Oh. Joy. We spend a bit of time bantering about Flash and Reverse Flash with Zephyr and his twin. He points out I’m down half a sword, making me have half a soul. I’m a so man. The two of them start to argue about who needs to draw a mustache on the other’s face, and Merlin crit-fails his roll. He winds up with a giant phallus on his forehead, with Other Zephyr making fun of him for being so slow. Here we go. They challenge each other to a race. Then the one-uppsmanship starts. Then The Commander steps in, and demands to know what the loser has to do. 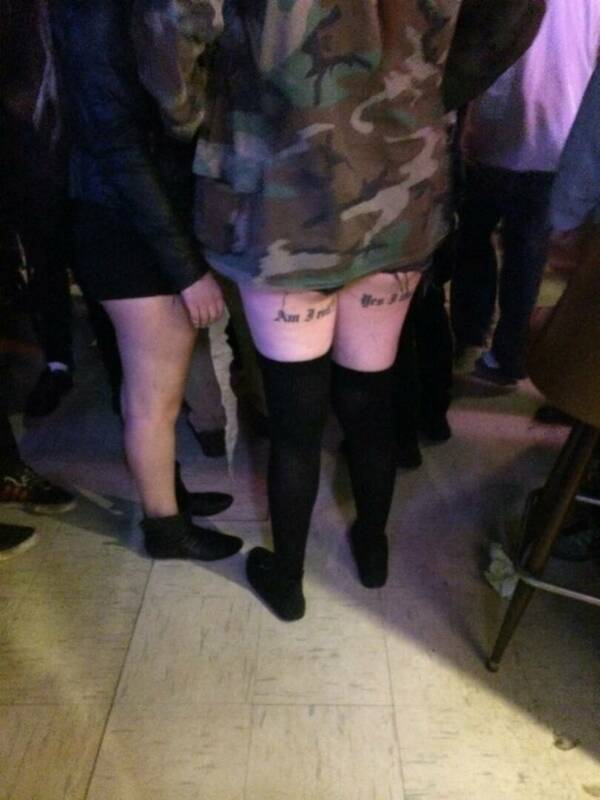 We decide on an “I’m the Evil One” tattoo. He loses. Arc Light holds him down and we tattoo him on the back of his legs. Reforging the sword is to be part of today’s game; Christopher said that last week. I’m assuming this is more than just spot-welding, so there’s some game to be had there. Might need a new piece of orichalcum, frex. We should probably pull a data dump of the Blue Sky HQ, which means another infiltration. While that data tap is very very tasty, I think we should consider assuming at some point that it’s outlived its usefulness or will be discovered and turned against us. We should “triangulate” on the Blue Sky Scarface by using our most recent data pull (see above) with external computer hacking in order to identify a few nexuses (nexi? Nexuses.) of possible activity, and then take the fight to them. My preferred tactic would not be hitting Scarface directly, but acting to simultaneously make his life difficult in three to five places. Disrupting two of his current operations, making inroads on two more of his bases or depots where he’s NOT going to be present, plus an informational and/or psychological warfare trick or two. I don’t think we’ve been exploiting the sorcery angle enough. Zephyr should brainstorm on how we can use the surging magical power for good rather than evil. These are by and large considered good plans by the GM and players. Anyway, we need orichalcum for the sword, and Zephyr (the evil one, who is our one) fails the roll . . . but his good twin argues that that isn’t how you do a magic circle, this is how we do a magic circle. And he makes his roll. A GM-NPC has never been so much fun. Merlin has had quite enough of this, and he has extra karma to burn. So . . .
There’s quite a bit of orichalcum in the Van Dorian industries building downtown – they came up with super-suits in the setting, so they have it. And they know the only orichalcum mine in the world, which they keep as a closely-guarded facility. Oh, and there’s a bunch of it in the Blue Sky building outside of town. Yes. That sounds like both what we need, and who it need it from. Zephyr and Other Zephyr start arguing about who’s Dr Evil and who’s Mr Bigglesworth. We have plans for the building from our last data tap. If we successfully eliminate the Blue Skies source, they’ll have to get more if they want to keep outfitting their supers. So Blue Skies would have to go to Van Dorian’s facility or the secret mine to get more, which makes them predictable and would allow us to start taking the initiative. We make the call to Eamon’s contact so we can try and get a meeting with van Dorian himself. We don’t lie, but we definitely are cagey with our information. Eamon has to burn two karma to make van Dorian in NYC in a convenient way; The Commander spends two karma to make Tokugawa and he old friends, or at least acquaintances. Actually, I don’t, because the GM is evil and they already knew each other. Tokugawa can’t make it – he’s in the process of bringing every useful swordsmith in Japan to me, since (for plot reasons) I can’t be in Japan. We head over to the Van Dorian building to a very secret room using a very secret approach method, and we’re informed by a helpful AI that our appointment is in 10 minutes . . . and the computer is very, very confused by the two Zephyrs. We’re greeted by a receptionist on the top floor, and we’re invited to sit. In a bit, van Dorian comes out, an older gentleman who looks like he just worked out. We introduce ourselves: Luca Damini (Arc Light), Ian Owari, The Rat Queen, Zephyr, Evil Zephyr – a redundant backup, perhaps. We show him the broken sword, Eamon’s unbroken sword, and lay out the concept. Deplete Blue Skies’ orichalcum reserves, then Blue Skies will have to go get more, which means Van Dorian. So . . . bringing him in on the deal. He asks if we’re basically telling him we’re going to commit a crime. No, we have reason to believe this stuff is being used to commit crimes, so between Civil Asset Forfeiture and strategic military action, we can take it. Van Dorian shows us a file that shows that there are three stockpiles that Blue Skies has, plus one location that has re-engineered refining equipment based off of Van Dorian’s designs. Some crazy Russian (a meta called The Engineer) did it for them. It blows up frequently. I spend two karma to make him a wanted man already by the government. I critically succeed on an Intel Analysis roll, and we put together the plan from our own data as well. There are facilities in Florida, Norfolk, and NYC. Van Dorian agrees to send a team to Florida. We send Onyx (karma spent to force the appearance roll), Katana, and the NPC Zephyr to Norfolk so that my SEAL allies will have competent leadership and metahuman backup. We first raid the Blue Skies facility again. I roll vs a base skill of 29, roll a 6, and with help the net is I make it by 27, overwhelming the -10 BAD and managing to hide the data tap even deeper than last time. We also use some of that extra mojo to try and determine the algorithm by which they program the security in the keycards. He spends karma, making it an auto-crit. We have a universal superuser access card, and it’s off the books. The keycards will get us into all the facilities, not just the one in New York. Now we have to go back and get yelled at by . . . oh, Tokugawa hasn’t arrived yet. Ah. Christopher is messing with us using Doom. OK. Back on mission then. Tactics, with plenty of Teamwork from everyone but Other Zephyr, who crit-fails . . . but then spends 5 karma to turn that into a critical success, because Other Zephyr can’t be one-upped by Evil Zephyr. With a BAD of -9 and -4 for planning three separate ops, I still succeed by 14, and get 15, giving me 5 karma to spend on anyone involved with any of the teams. We resolve the other teams stuff first, and I spend 4 of the 5 karma to make the raids, which would have succeeded anyway, turn into critical successes, and the two teams are in and out like ghosts. We have one Team karma left for ourselves. The plans we have suggest they have tons of microcams all over the forest. The compound itself is in upstate New York. We check in with the other teams – each location had something like 75kg of orichalcum, so we can carry it out. We stage in with the VERTOL, and use Eamon’s gravity manipulation to TK us onto the roof pushing 2FP for No Signature. We fire off a gizmo or three to spoof the motion sensors on the roof. There’s a pot with cigarette butts in it right outside of the door. There’s no one beyond the door, and several below, says Eamon’s TK sense. We know from the blueprints that it’s a single floor with vaulted ceilings that contain the equipment. The doorway we’re standing at leads to a staircase that will take us where we need to go. The orichalcum is located in a several-ton vault in the back, which we decide we can crack with Eamon’s TK+Lockpicking. The Commander gets Arc Light in by making a Stealth roll by 15; Arc Light gets inside the security room and disables the cameras. Our magical mystery keycards take care of the rest. The room is hot. Very hot. There’s a blast-furnace heat here. Arc Light makes an Inventor! roll to sabotage the system; Eamon and Zephyr, who really is Evil Zephyr with Criminal!-19 skill, is the actor doing the lockpicking. Zephyr crits with a roll of 5, even without Eamon’s help. With it . . . they could steal so much. Arc Light crits his Inventor! roll. 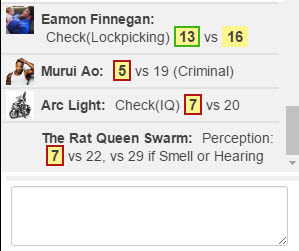 The Rat Queen crits her Perception roll. Holy. Crap. The Commander spends karma to roll twice to get us out, and makes the roll by 19 (not a crit). Arc Light also burns karma to try and steal the orichalcum refining technology. He’s got Inventor!-20, an eidetic memory, and needs to spend 5 karma to get this done. We exit with the orichalcum in hand, and a certainty that the next time the reactor is used, it’ll go up. We spend karma to make it certain that it happens to our schedule. So . . . that leaves us with all their orichalcum in our hands, and their only refinery will definitely blow up on the morrow. Our next step is to go after the Engineer. This is a black bag extraordinary rendition situation, against The Engineer, a wanted rogue weapons designer, likely created purposefully by Russia (or maybe Iran). We need to find him first, though. Zephyr makes a Streetwise roll to find him through criminal contacts by 12 (Russian mafia comes through); The Commander makes an Intel Analysis roll by 12 on his end as well. He’s currently in a Blue Skies facility in South America, where he’s working on a project that’s so secret it’s not even in the Blue Skies archives. At all. We do have a code name for the project, called BIRDS EYE. We will be partnering with General Legend’s operatives to extract the Engineer as a black ops mission sanctioned by the government. We had a ridiculously successful mission. Almost too many crits, but they were all legit, and they snowballed – we had extra karma from great sessions the last few times, plus the boost karma from the crits, and we spent it like it was going out of style to basically force Blue Skies into the corner we think we want them in. Error 404: Zephyr Not Found.